PyQt is a module to make desktop software with Python. This works on all desktop systems including Mac OS X, Windows and Linux. If you want to make desktop apps with Python, PyQt is the module you need to make them. After creating your app, you can create an installation program with fbs. PyQt is a port of the Qt library (C++). Qt is a very powerful GUI library. PyQt is not a single module, but a collection of modules. QtCore, QtGui, QtWidgets, QtMultimedia, QtBluetooth, QtNetwork, QtPositioning, Enginio, QtWebSockets, QtWebKit, QtWebKitWidgets, QtXml, QtSvg, QtSql and QtTest. So what’s in these modules? Qtcore contains the core non-GUI code. QtGui has everything for window management like event handling and graphics. QtWidgets has a many UI widgets like buttons, labels, textinput and other things you’d see in a desktop window. QtMultimedia for multimedia content and camera. QtBluetooth scan bluetooth devices and connect. QtNetwork a cross-platform solution for network programming. Set up a socket server or client that works on all desktop systems. Supports both the TCP/IP stack and UDP. QtWebSockets implementation of the websocket protocol. QtWebKit web browser implementation. You can use this to render a webpage. This is based on WebKit2. WebKit is used in the Safari browser, by KDE and others. QtXml use XML files, reading/writing and so on. QtSvg svg graphics (Scalable Vector Graphics (SVG). A type of image format. You can easily make desktop software with PyQt. There are two ways to install PyQt: with an installer and from code. You can view the tutorial on PyQt installation. After PyQt is installed, you can create all kind of desktop software. 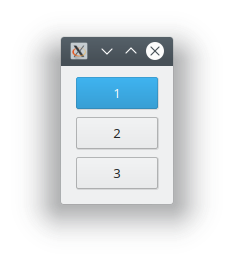 PyQt has many widgets including buttons, input fields, combobox, webview and tons of others. This is straightforward and you will learn how to do that in the next tutorials.